Introduction The foremost unique feature of the MR2 is the mid-engine layout, and with this, the car is agile, outstanding in traction and the sharp in handling. The first Japanese mid-engined mass-production car, the MR2, possessed all of the traits of a mid-ship vehicle... but it's twitchy nature challenged the best of professional drivers. As Mr. Sakurai, a former TRD development driver of the N2 Spec AW11 noted, "the car spun me around clean at Fuji Speedway ... I quickly counter-steered in a hairpin...but, it hit me like if I had no time to think...it's much like a F3 car I set up regularly...fast and unforgiving." This wasn't the only character of the car resembling a formula car, however. On the AW11, the alignment adjustability is far more flexible than any other Toyota car in production trim to date. The tow, camber, castor each were adjustable at all four wheels. Such feature made great challenges to the tuners in those days to come up with the correct alignment. In short, there were so much possibility in alignments that it was just as easy to totally destroy the car's balance as was to set up correctly, or to a driver's favor. Another factor making the AW11 a joy and a challenge to tune is it's engine, the 4A-GE that Toyota introduced a year before in the AE86 Corolla. It's original configuration was needing more power so a supercharged model was introduced after 3 years. Insider's rumors said that the supercharged model was a idea and product of Mr. Sakurai's strong push for such engine. 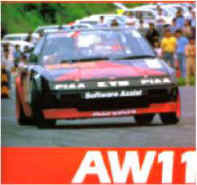 The AW11 with the supercharger was now able to overcome handicaps of the heavy body structure and shine on tracks. Before starting any AW11 project... Since the AW11 you are starting will most likely be a well-used car, here are some things you will need to take care of before doing any modification. The first element of the AW11 that frequently needs service or is worn out of spec is the synchronizer ring and hub sleeve for the transmission. A tell tale sign of this is an oil leakage between the bell housing and the engine block. On supercharged models, there should be a smooth whine from the supercharger unit when operating and should be rattle free at idle. Do an oil change in the supercharger if in doubt and re-check. SC oil change kits should be available at dealerships with necessary filling syringe and oils. In all cars, before a modification, obtain new timing belt and all fluids and filters. On the suspension side, again as in all used cars, replace all your suspension bushings and recalibrate your alignment. TRD bushings are recommended for it's good resistance to drive train judder as well as fairly mild compliance in ride. If investing in a AW11, try to find one that's cheap, and work these new pieces in...the AW11 chassis is remarkably strong so there's not much difference between cars with different mileage. , the rear control arms had to be shorter than desirable. This creates a situation where the rear camber alignment change is too excessive when the car rolled from side to side. A natural way to suppress this effect is to make the car exhibit less roll in the rear by using stiffer springs and dampers progressively balanced. The use of 9 to 10kg/mm spring ratio will balance nicely with the front's 4.0kg/mm mentioned earlier. By using stiffer springs in the rear, the suspension will make less weight transfer and at the same time, making the loss of adhesion at rear more predictable and controllable. On cars with T-bar rooftops, a roll cage should be used with such stiff springs, so the body doesn't give in and create more stroke at even more unpredictable camber changes. The hard top models are fairly stiff in this respect and isn't necessary (unless of course, your track regulations state so for safety issues.) On cars lowered more than 3cm from stock, always use roll center adjuster blocks on the lower arm to correct the camber geometry as well as pivot center weighting. You can set the camber up to 3 degrees in the rear depending on tire choice using the setup mentioned above. For best balance, for non-supercharged models, use the same size and width tires at all four ends and correct handling and grip by alignment. An ideal size would be 195mm width in 14 or 15 inch sizes. On supercharged models, extra weight and power should be offset by the use of one size larger tires at the back with maximum of 225mm width. Lastly, stay away from using pillow ball or ball-jointed suspension components as these parts are race-use design and make the car extremely peaky in demeanor. Additionally, these joints will stress the suspension mounts and can cause stress cracks over short period of time. They should be only used on race cars that are disposable after a season of runs. Even when changing rubber or polyurethane bushings, never use more than 200% stiffness over OEM for the same reasons. There are many ways in which people set-up suspensions, so use this as a guideline in making your AW11 handle for fun factor. Depending on the diver skills, this isn't the only, nor the single fastest way to do this. But stay focused, the AW11 is the most easiest car to really screw up the suspension by setting it bad. Experiment, and you shall find a setting that's matched to your level and taste... Most of all, have fun doing it! or else what do I write this stuff for?